There is flooding in Lourdes and a mistral has arrived in Cassis. The flood is heavy and deep, the winds, though breaking up the heat, – they’re volatile. My cousins have been with me a good week in perfect weather and now are on the second stage of their holiday after taking them to Avignon, where their Riverboat is waiting to glide the Rhone River. I’m glad the waters haven’t reached them nor the winds. Not that this wouldn’t be the perfect catastrophe ending to their beginning. 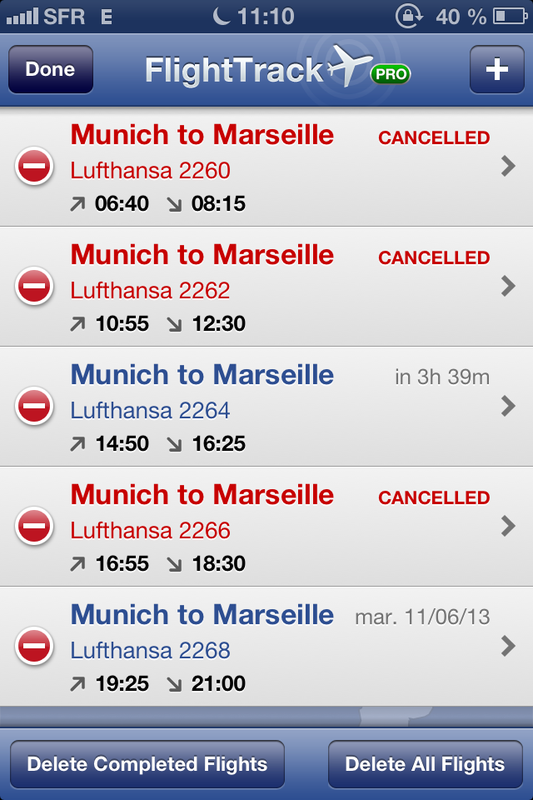 Maria arrived in Marseille via Munich and then via Rome. 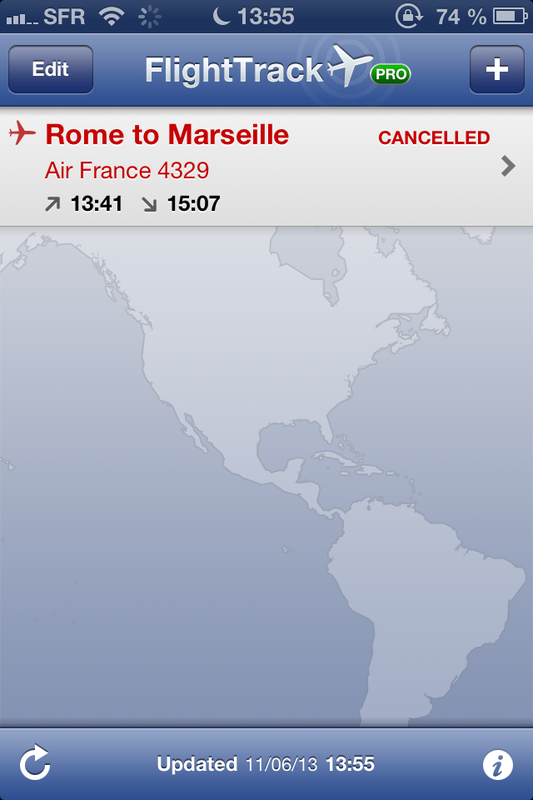 Rome Cancelled, and……. She was supposedly arriving WITHOUT her sister. Her sister Judy’s plane was delayed out of Norfolk, therefore she missed her flight to Munich from Charlotte. She stayed over and was told she couldn’t get out until THURSDAY, and this was only Monday. No way. And why was this? A “GREVE”, ofcourse or STRIKE , among the French Air Traffic Controllers. (but ofcourse). They were striking against losing their autonomy and power if they consolidated the French and other European Union countries ATC to BELGIUM. THey would also lose jobs. This was a big concern. So Judy stays back in Charlotte at her brother-in-law’s house and waits to do battle at the ticket counter the next day. In the meantime, all flights out of anywhere in Europe are showing cancelled into Marseille according to my Flight arrival APP. 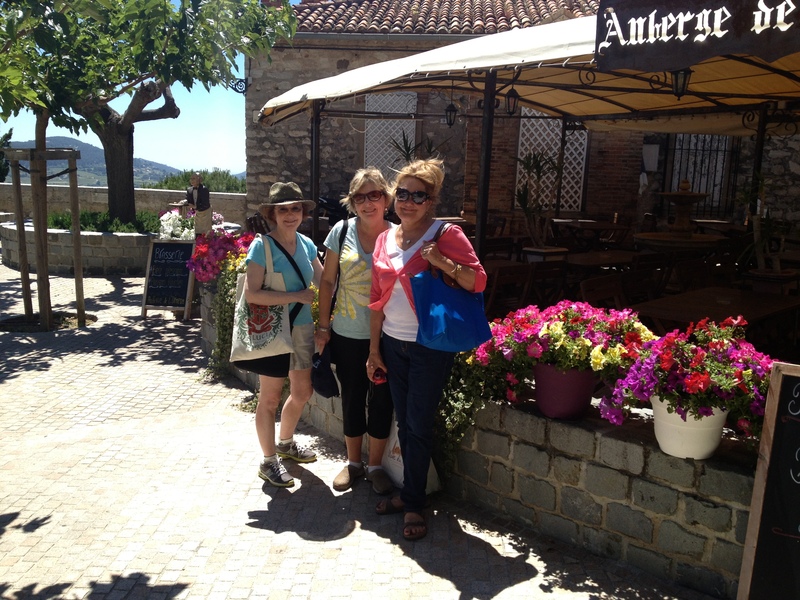 I don’t want to trust the iPhone App, so we head over to the next big town, Aubagne, to check with a travel agency. She said the same thing……..that “flights from Rome are not coming in today”. 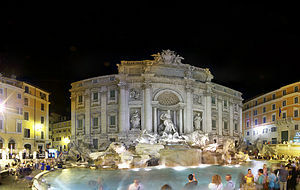 We imagined Maria throwing coins in the Trevi fountain. And then the phone rang. 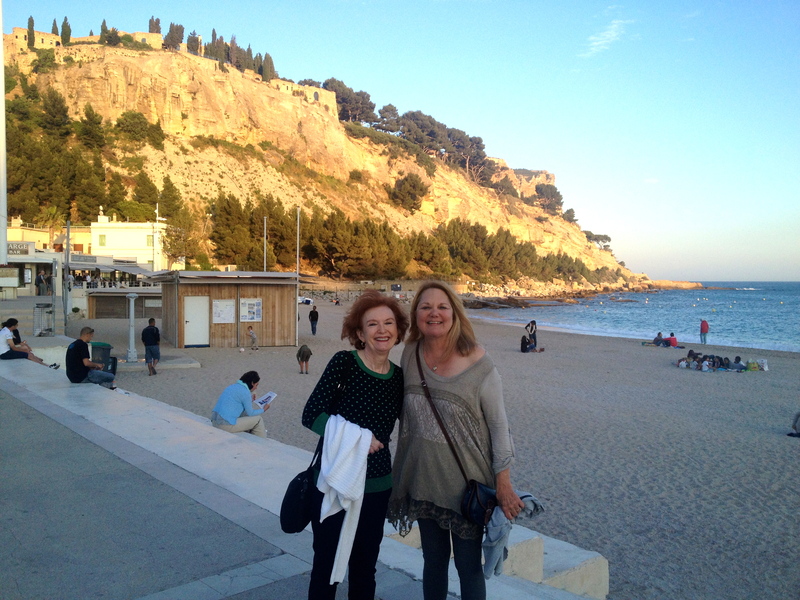 It was Maria, calling my French number from baggage service, and she WAS in Marseille – waiting patiently for me . 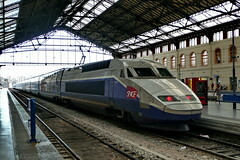 We were in the middle of Marseille rush hour so it was not a fast journey to reach her. Poor girl. Maria got picked up and not one word of complaint passed her lips she was so positive about everything. I love this type of guest. We delivered her to her very lovely Hotel Royal Cottage, next to our apartment and let her unpack and decompress before going out to dinner on the port. 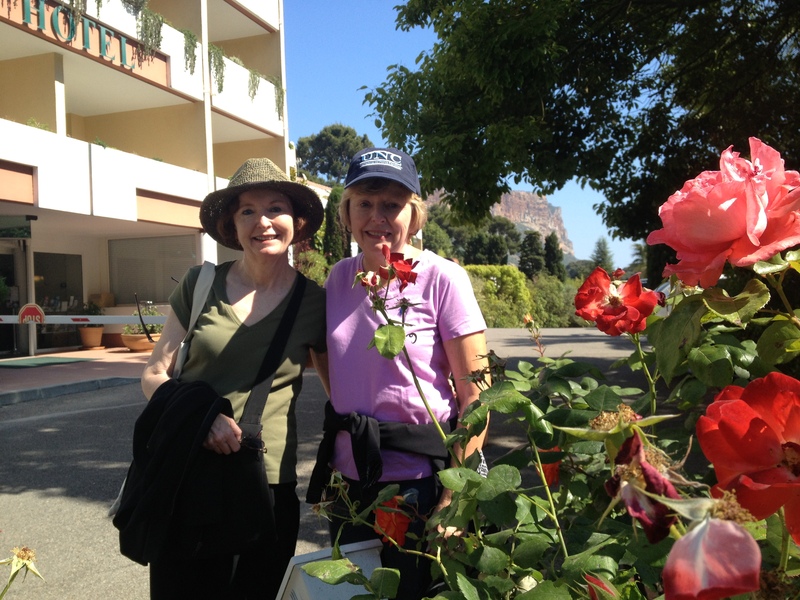 The next day Judy did get on a flight and while Maria was having a massage in the tiny spa place in the middle of our village, David went to teach, and I went by metro, train and bus to gather Judy from Terminal 2 – as she had been rerouted through to Paris and then to Marseille. At least they had the decency to upgrade her to First Class and she got to sleep in the “pod” – champagne and all. Very nice. She said that her USAIRWAYS agent had worked diligently from the time she left to go back home trying to find her a seat. They were backed up with other cancelled flights which meant, ofcourse, more passengers to book than seats. Not a good situation. Well, by luck, it worked and it spit out our tickets to Cassis and we were on our way. 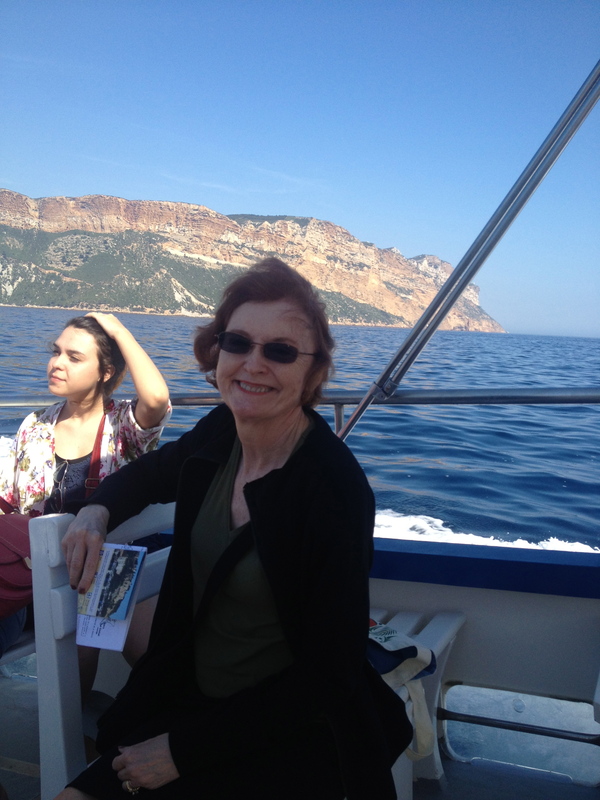 Arriving in Cassis, I said to Judy, “ Now don’t worry, I know there are steps down to cross the tracks (under the tracks) but you wait and see,…….there will be some strong guy that sees us struggling with your bag and they will come to our aid immediately and take it down for us. Just watch”. She was doubtful, as was I, because we were at the end, the last off the train – and no one was behind us, least of all a strong and strapping homme. However, as we started down with the heavy bag, a young girl (about 19) said in French….” Do you need help with your bag?” and I said emphatically, “YES, PLEASE!” and she lifts it in one fail swoop and takes it to the bottom of the stairs for us. I so love these French. Judy was amazed. We were going to get the taxi, but there was no one IN the taxi as usual…….these drivers disappear to somewhere, everytime I go to get one in Cassis………so we saw the little white bus and asked him if he would stop by Hotel Royal Cottage, which he absolutely would. The strapping young fellow picks up Judy’s bag with one hand and puts it on the bus for us. It was lovely. After arriving at her hotel and finally meeting up with her sister, and unwinding, they were ready to hit the port and see everything and anything. They were amazing. I was ready for a nap. They were ready to hike! Funny. 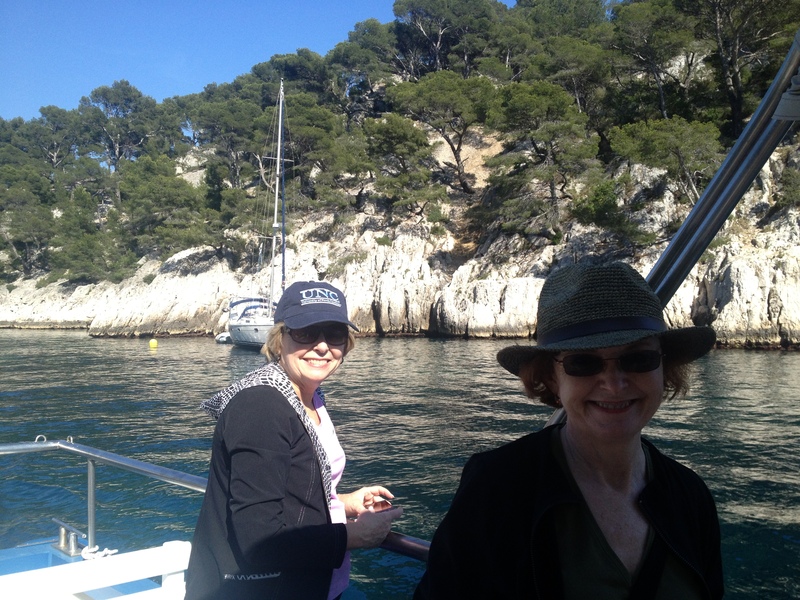 We enjoyed the beautiful tour of the CALANQUES as it was a lovely sunny day and not too windy, so we would not get sea sick. Our lunches were taken right on the beach, Sometimes we split the most beautiful meals, (which is the way David and I have eaten here for-ever now ) – as sometimes in France even the portions are too big for one! 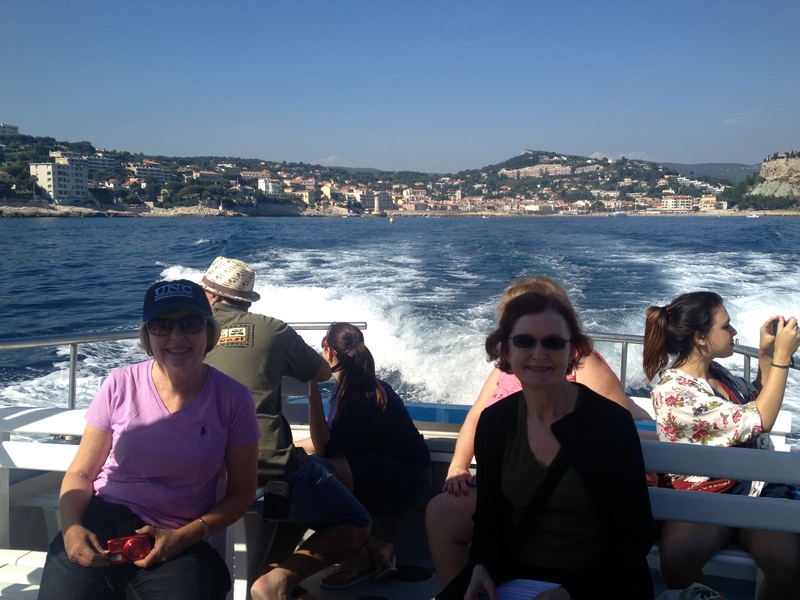 We enjoyed crystal clear white wines of the Cassis regions, rich burgundy wines from the Rhone all outside in ample sunlight and cool breezes. Judy got her massage the next day, even though I tried to get her in as soon as she came off the plane, but there was no possibility of that. 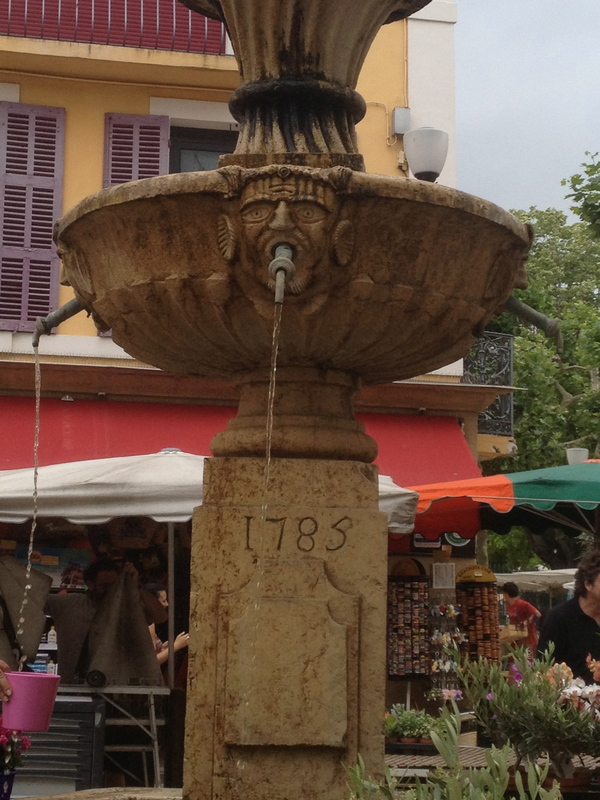 While she did that, Maria shopped at the special Cassis marche (market) in the center of town , next to the 1700’s fountain and curving around to the plaza where ice-skating had closed 2 months ago………. colors abounded of clothing, leather goods, scarves, children’s items, tablecloths, jewelry, food section of every conceivable food from sardines to heirloom tomatoes to specialty olives and tapenades, breads, cheeses, tons of vegetables. 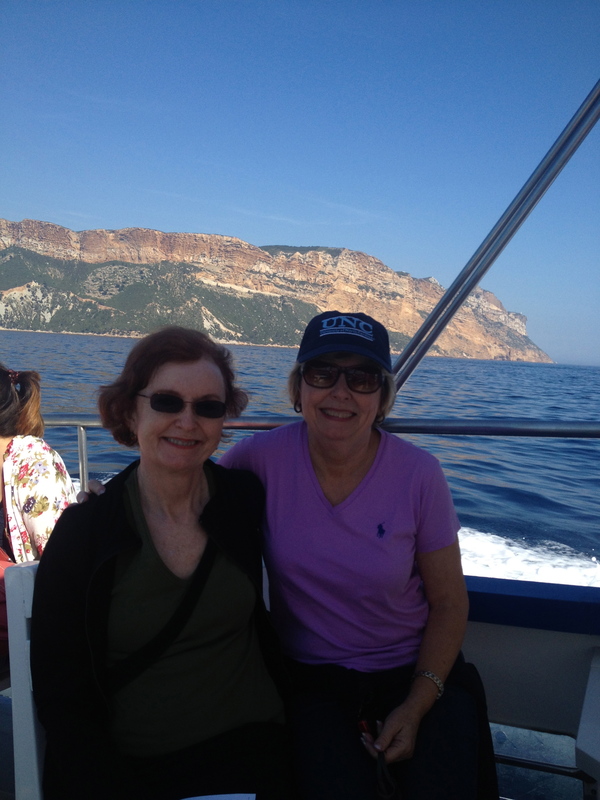 We toured the top of Cap Canaille, one of the most beautiful places on earth very high up overlooking the entire village of Cassis and the lovely Mediterranean. We were in the CLOUDS that day, adding to the special feeling. 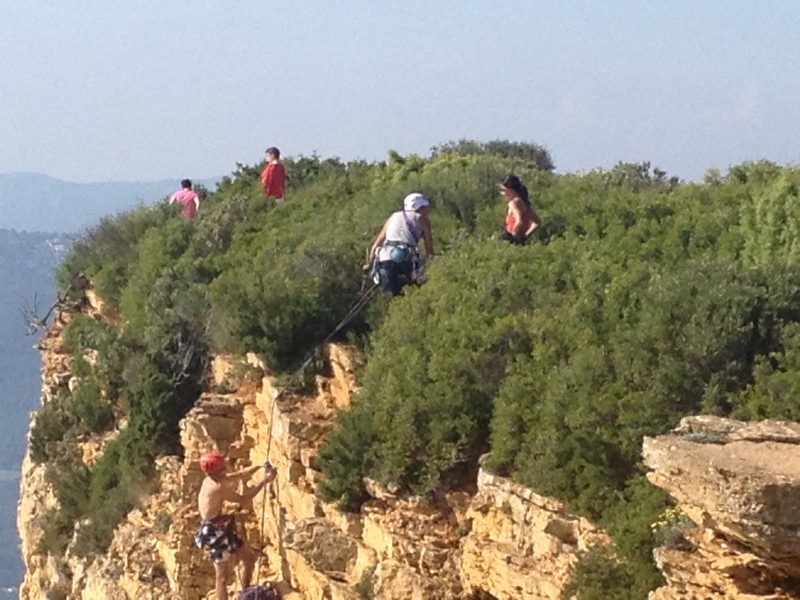 Mountain climbers were on their way up as well. On Friday night we had special entrance tickets for the PAUL RICARD CHATEAU, where the summer party took place for the MAABN (Mediterranean Anglo American Business Network). We arrived early as David had to set up a display for the British Council, so we waited patiently to nibble on something and drink . In the meantime, we made ourselves busy by checking out the Chateau of Paul Ricard. HIs name is synonymous with the famous PASTIS, the drink of southern France. But, here is where it gets weird. While I knew really no one at this party, except David’s director and the manager of the school, and did speak to them, my cousins, very accustomed to party-ing in North Carolina, took it among themselves to speak to a vast amount of people, and finding out all sorts of interesting tidbits about them, and then introducing them as though they were friends from the distant past and this was their party! The games that took place on the lawn, brought them out to cheer and congratulate and I stood back in amazement at their enthusiasm and festive spirit. In the meantime, I took to the Chateau to take a seat as there were very few seats in the party area outside and I really needed to get off my knees, which were locking up causing me pain. I can climb the Garlaban, but don’t make me stand! Where was the seat? No seats in the Chateau!! What the heck?!?! So, I found the toilet seat, which was the only one, so I was gone for long periods of time. I think I raised eyebrows as some people were asking where I had gone, but it was my secret, (until now) and when you gotta sit, you gotta sit. I truly have a weird life. If I were doing this party, however, I would have had more chairs…….not everyone at these functions is 30!! The outside buffet was finally served and everyone lined up for food as they were famished as drinks had been rolling out now for about 2 hours. There was ONE person to serve all those people and I thought to myself – at how many functions I have done myself like this, but never with ONE person to serve everyone. David wasn’t too happy about that – – The cousins – non-plussed – as usual – they were so accepting of it all. Delightful. (BEST PHOTOGRAPHER) http://ateliervisit.com/wp/profiles/photographers/robert-hale/ and took hundreds of photos of the festiivites – a lot of my cute cousins. The funniest scene to me – was coming out of the Chateau once again (where I had been SITTING) and dessert was announced, and there — walking across the long stone fountain, serenaded by the LOUDEST FROGS known to man, was my cute cousin Maria with her LILLET Panama red striped HAT heading for the dessert bar with her sister in tow in her matching hat………I thought…….I really should have a video of this…….. it was so charming, so priceless. So, the tour of Cassis, Bandol, Marseille , & the Medieval town of Le Castillet, comes to an end and we deposit our cousins in Avignon, amongst the gleaming Viking River Ship ready to scout the Rhone and all its glories. Mes Cousins arrived like a scattered Mistral and left me with a flood of emotion of gratitude and love for them…..for their incredible resilience, fortitude and enthusiasm for life anew – in unexplored cities and villages and which I hope they will never ever forget. They have a French name after all…….. and then they both look so very French. Yes, and that’s a compliment. Great story of your cousins’ visit. I felt I was back at the Chateau with them again! Great pictures also. So happy your visit with your cousins was so wonderful! You and David are fabulous hosts!